Several early Olympians once lived in or practiced near Cleveland Heights, within blocks of one another, not far from Roxboro Junior High School. Three of those Olympians were in the same “Chariots of Fire” Olympics, in Paris in 1924. Up until 1924, Nordic countries dominated the javelin, winning all the medals at the previous Olympics. Gene Oberst became the first and only American to win a medal (bronze) in the javelin in the first half-century of the Olympic games. This was also America’s first medal at the VIIIth Olympiad, when the stars and stripes flew over Colombes stadium for the first time. The previous fall, Oberst had blocked for the legendary Four Horsemen at Notre Dame when they defeated the national champs—Princeton. He also blocked for the Gipper (played onscreen by Ronald Reagan)—probably the most versatile player in football history—when Notre Dame won the national championship. Earlier that spring, Oberst shattered seven track and field records across the nation, including those at the prestigious Kansas, Drake and Penn relays, when he became the national champion. His track and football coach, Knute Rockne—the winningest college football coach, with a record of .881—was a second father to Oberst, guiding, consoling and praising him through his early career. Oberst’s Olympic diary contains stories of the American Olympians who lived, ate and socialized with one another during the eight-day voyage to France, and at their makeshift, plywood cabins on the Rocquencourt estate (20 to a cabin), along with the British speedsters (of “Chariots of Fire” fame) and the English princes, soon to be kings. Oberst later lived near three of his teammates, DeHart Hubbard, who lived in Cleveland, and Johnny Weissmuller and Benjamin Spock, who lived in Cleveland Heights, as did Oberst. Hubbard, who competed in the long jump, was the first African-American individual gold medal winner. A bright student, he grew up in Cincinnati with no real hope of attending college, until a Michigan State University alumnus, Jim Barringer, encouraged fellow alumni to purchase Cincinnati Inquirer subscriptions from Hubbard. Thanks to Barringer, Hubbard won a full scholarship to Michigan State, where he became an outstanding athlete—despite having to deal with racism during the KKK’s resurgence in the 1920s—more than a decade before Jesse Owens’s phenomenal performances. Hubbard later moved to Cleveland and worked for the Federal Public Housing Authority, dying here in 1976. Weissmuller, the athlete who won the most medals, became known as “the fastest swimmer alive,” setting a record for the 100-yard freestyle that lasted for 11 years, and winning a total of three gold medals in swimming and one bronze medal in water polo. The first talking Tarzan, Weissmuller later spent a summer at The Alcazar in Cleveland Heights, while performing at the Great Lakes Exposition. Spock, the famous child psychiatrist, wrote the parenting books used to rear the baby boom generation. Spock helped the Harvard eight-man rowing team win a gold medal in the Paris Olympics (before the “Boys in the Boat” won in 1936). In 1936, during the depths of the Great Depression, an unemployed and discouraged Oberst was struggling to provide for his wife and four children, ages 1–6. He enthusiastically accepted a position at John Carroll University (JCU) in University Heights, when the town’s population was less than 4,000. Expecting to leave JCU after a couple of years, Oberst would stay on for 35 years as a coach, athletic director and history professor, and live in Cleveland Heights for 55 years. Oberst was among the first class of inductees to the JCU and Greater Cleveland Sports halls of fame. One of his three sons, Albert Knute Oberst, has lived in Cleveland Heights for more than 80 years. Robert Oberst, a graduate of Heights High and JCU, was born in Cleveland Heights and lived here for more than 30 years. 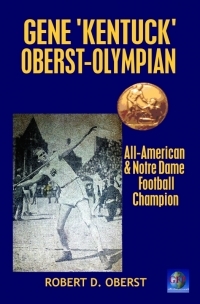 His third book, Gene 'Kentuck' Oberst - Olympian, describes his father's athletic experiences, long before Robert was born. A copy of his book is available at the Lee Road Library.